As in all Italian cities, many of which are very old, with medieval or even Roman structures, parking your car in the center is not always easy and can take hours to find the right and safe space. There are few free parking spaces, where you can find a place, but generally in Florence the problem of traffic is very felt, especially in the historic center. There are a few free places near Piazzale Michelangelo, which is also the only area that does not have a regular street cleaning and so you can park during the night without having to worry about moving the car. It is difficult to find a place here, but if you can, from here there is a short and pleasant walk to the center or you can take the bus number 12 or 13 to the city, which arrives at the train station. Keep in mind that during the summer in Piazzale Michelangelo there are often concerts and events in which they can close part or all of the parking area - look for temporary signs and large quantities of empty spaces that tell you that you can not park. A special event that takes place every year at Piazzale Michelangelo is the fireworks display to celebrate the day of the patron saint of Florence - San Giovanni Battista on 24 June. It will not be possible to park here around that time. Someone, to avoid traffic problems, leaves their car in the parking lot (without bar) of IperCoop di Ponte a Greve and from there takes the convenient tramway that takes you to the center in a few minutes. Another possibility to park for free is at the "stradone dell'Ospedale", and from there take the tramway. A more central free possibility is the one in Viale degli Olmi in the Cascine Park. From there you can take the tramway and from there take the tramway to the station of Santa Maria Novella. The ZTL area in Florence, i.e. the limited traffic zone, is an area where access, circulation and parking are regulated by special regulations, so you must be careful not to enter, unless you have a permit to avoid very expensive fines. Before every entry to the ZTL there are signs and cameras, so they are quite easy to avoid. The LTZ in Florence is in force at certain times: from 7.30 a.m. to 7.30 p.m. on weekdays, and from 7.30 a.m. to 6.00 a.m. on the following Saturday. We do not recommend that you venture into the center with your car so as not to find yourself having to pay heavy fines in case of prohibited parking and transit. The ZTL in Florence is in force at certain times: from 7.30 a.m. to 7.30 p.m. on weekdays, and from 7.30 a.m. to 6.00 a.m. on the following Saturday. If you have booked accommodation for your holidays or a short visit for business or pleasure in Florence, and this is in the historic center, you will be able to enter the ZTL to unload the luggage / people and then park outside the ZTL, however, provided that your hotel or accommodation does not offer a private parking (in this case it will be your responsibility to notify the hotel your number plate, so that they in turn provide it to the municipal police for temporary entry). 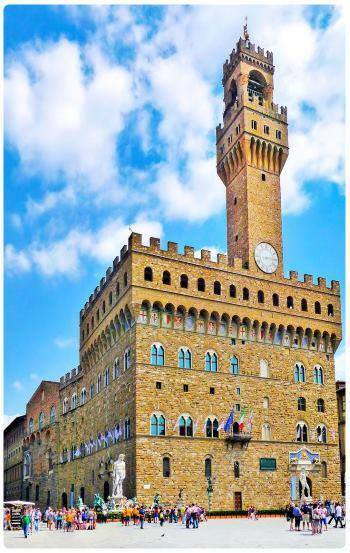 To apply for permits and temporary parking permits, visit the page of the municipality of Florence mobility section (in the link highlighted next). Below you will find the map of the ZTL of Florence by zones and times. The LTZ is in fact made up of five sectors: A, B, O, F and G. The historical heart of the centre is marked with the letter A (Duomo, Ponte Vecchio and Palazzo Vecchio are included in this area), while the area of Santa Maria Novella Station is marked with the letter B; the area of Palazzo Pitti, on the other side of the Arno, is marked with the letter O. With 901 seats available, of which 697 are paying, 17 are reserved for the disabled, at 3 €/h. Consider that from Santa Maria Novella station to the historic center are only 15 minutes walk. Nearby there are the station of Santa Maria Novella, the Basilica of Santa Maria Novella, the Fortezza da Basso, the Firenze Fiere, the Basilica of San Lorenzo. With 179 seats, of which 175 paying and 4 reserved for disabled people. At €2 the first hour is increased from the second to €3 euro and up to €8 euro for the following hours until 14.00 (€2 hours from 14.00 to 07.00 the next morning). Nearby are the Central Market of San Lorenzo, the Basilica of San Lorenzo, the Biblioteca Medicea Laurenziana, the Cathedral of Santa Maria del Fiore. In the area of Fortezza da Basso-Fiera, not far away and behind Santa Maria Novella and the Garden of Valfonda. At €1.60, with 165 seats, 4 of which are disabled. Nearby there are the Fortezza da Basso, the Piazza Chiesa di Santa Maria Novella, the Santa Maria Novella station, Piazza dell'Indipendenza, the Garden of Valfonda. In the area of Fortezza da Basso-Fiera. With 521 paying seats, 11 of which reserved for the disabled), and €1.60 per hour, €20 per day. Nearby there are the Fortezza da Basso, the church of the Sacro Cuore al Romito, the Teatro Romito. In the Santa Croce area, open 24 hours a day, with 379 seats, 371 of which for a fee and 8 reserved for disabled people (located outside). At €1 the first hour and €2 and €3 the next until 14.00, and €2 from 14.00 to 7.00 the next morning. Not far away are the Basilica of Santa Croce at about 700 meters, the Israeli Major Temple, the Church of Sant'Ambrogio, Piazza Massimo D'Azeglio. With 210 places available and 205 paying, and 5 reserved for the disabled. Nearby you will find the Israeli Major Temple, Piazzale Donatello, the National Central Library of Florence, the State Archives. With 312 places available, 306 for a fee and 7 disabled people. At €1.60 per hour, from 08.00 to 20.00 and €1 after 20.00 and until 8.00 the next morning. Nearby there is the Church and Cenacle of San Salvi, and direct transport to the Stadium Artemio Franchi. Just beyond is the area of Santa Croce and Coverciano. The largest in the city, with 1006 seats available, of which 656 paid and 300 sold and 20 disabled. At € 2 euro per hour and € 10 daily, on the first day, increased by € 5 in the following days. Nearby are Freedom Square, the Garden of Horticulture, Savonarola Square, the Russian Orthodox Church. With 300 seats available, 8 of which are reserved for the disabled (external), at €1 per hour, €2 later, €20 per day. Nearby we find the station Leopolda, the Teatro del Maggio Musicale Fiorentino, the Cascine Park, Villa Strozzi al Boschetto, the station Firenze Porta al Prato, the garden of Palazzo Corsini sul Prato, and a few blocks away, the station Firenze Santa Maria Novella. Outside the historical centre. With 218 seats available, of which 148 paying and 65 disabled. Rates are €2 for the first and subsequent ones. Nearby there are the Boboli Gardens, the Torrigiani Gardens, the Museum of Natural History - Zoology La Specola, the Pitti Palace, the church of Santa Maria del Carmine, the church of Santo Spirito. North of the centre of Florence. With 879 seats available, of which 863 paying and 16 reserved for the disabled. Rates from € 0.50. Nearby there are the Meyer Hospital, the Careggi Hospital, the Villa Medicea di Careggi, the Villa Medicea La Petraia. (Viale Gaetano Pieraccini, 4) open 24h - maximum height (outside). North of the centre of Florence. With 406 seats, of which 397 paying and 9 reserved for disabled people. Rates from €0.50 per hour. Nearby there are the Meyer Hospital, the Careggi Hospital, the Villa Medicea di Careggi, the Villa Medicea La Petraia, the Parish of Santo Stefano in Pane. We remind you that in the historic center is active the service Florence - car sharing of Car2 Car2go, Share'ngo, Enjoy, AddumaCar, through which you can access the ZTL areas (see near the station and known points), with which you can easily pick up and drop off a car service. From August 1, 2017 is also active the service of Florence bike sharing, accessible through the free APP for smartphone Mobike and Ulisse Bike. Public transport in Florence is managed by the companies Ataf and Li-nea.